Infor is an multinational company that provides custom-built enterprise software for over 90,000 organizations worldwide. The Infor development team has created industry-leading solutions for major players in every industry imaginable, designing business applications that are functional, intuitive, and scalable. Kopis and Infor have a long-standing relationship that stretches back nearly two decades. Over the years, Kopis has been brought on as a valuable partner, especially when Infor has a specific need for additional resources in order to complete a contract quickly. For this project, Infor approached Kopis with a tight timeframe. 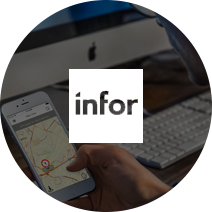 Infor had recently renegotiated a large, yearly contract with one of their clients—the contract required them to upgrade their existing EAM software to include an iOS app with GIS for location-based asset tracking. In addition to a location-based asset manager, the end-user needed Infor to develop a GIS integration that operates in disconnected mode so that users can position themselves on a map and see work orders, even if they lose Internet connectivity in rural areas or when working under a bridge or in a tunnel. Working with Kopis, Infor was able to deliver EAM Mobile for Transit, an iOS app that is functional in disconnected mode and auto syncs when a connection is reestablished. While working on this EAM app with Infor, senior developer Josh Spraker was able to spend time on site and sit down with the Infor development team to work out a collaborative solution. We began the process by scheduling a session upfront to go over the existing code for context and to define the scope of the project as well as our area of expertise. This project was unusual because the details of the deliverables were still being defined, but Infor had a fixed time and budget, so we had to be particularly flexible. We decided to dedicate a scalable group to this project that could ramp up or down as Infor needed. After the initial consult, we checked back in frequently with progress updates and sent our builds to the Infor QA team for testing. As we finished the project, we delivered architecture documentation and held several knowledge transfer sessions with the Infor team so that they fully own the code.